Collections of colors & textures . 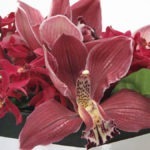 Orchids in lime & burgundy. Candlelight both high & low. 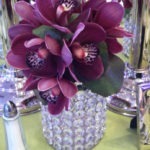 Everything sparkles more when seen through beautiful crystal prism vases, candle holders & votive cups. Even in the dead of Winter in Chicago, our floral designers can still create a burst of vibrant colors with fresh flowers from around the world. 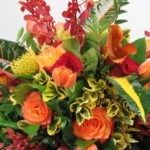 It’s a great mix of colors and textures with pincushion protea, tulips, roses, mokara orchids and assorted foliage.